January 2018: Welcome, visitors from Australia, Singapore, China, Thailand, Hong Kong and beyond! I started this blog in 2015 when I moved to Japan, and my audience is primarily family and friends who know me IRL. Yet clearly this one post about Jimbocho has filled a void for information in English. While most of my posts get views in the hundreds, this one post about Jimbocho ski shopping has been viewed thousands of times already! So I update it from time to time. Immediately below you’ll find my original post from November 2015. Please scroll to the end for links to other posts I have written about our ski trips within Japan, and other information that I hope you find helpful. Enjoy your ski trip to Japan! You’ll love it. Jimbocho boasts 30+ shops that sell all manners of snow sports equipment from the latest high-end releases, to past years’ closeouts, and everything in between. We popped into a few places to start comparison shopping, then headed to London Sports, widely acknowledged as The Place to go for bargains (since 1966!). The open boxes of jumbled base layers, ski/snowboard pants, and parkas drew large crowds of determined yet well-mannered shoppers. The kids and I joined in the browsing fun while Mark checked out the skis. He found the ski selection smaller and prices slightly higher than at surrounding shops, but the boot prices were much lower. He picked up a pair of never-worn Salomon boots from two seasons ago for about one third of their original retail price, and about 25% less than the best online price. The relatively strong dollar certainly worked in our favor, as one U.S. dollar currently trades for 122 yen. We returned to a shop we visited earlier, Vail Ski Shop. Mark settled on a pair of Rossignol skis that he researched back in the U.S. Again, thanks to the strong dollar, Mark got a deal on a never-used pair of last season’s skis. He paid about 10% lower than the lowest online price–and the online skis were used while his were brand new. Aren’t these gorgeous?!? Almost too pretty to ski on. For our past ski purchases back in the U.S., ski shops required a few days turnaround to attach the bindings and set them to the correct boot size and release tension. We assumed the same for this purchase, and we were pleasantly surprised to hear of the mere 15 minute wait to get Mark’s skis slope-ready. The salesman apologized for the long wait (!). We assured him that we could wait 15 minutes. Almost done! Mark’s skis get their new bindings. Note the spacious, dedicated work space (or not) for the sales staff. So Mark grabbed his new gear and embarked on yet another Tokyo rite of passage: carrying skis home on the train. We head out for our first ski trip in Japan shortly after New Year’s when we visit Nagano, site of the 1998 Winter Olympics. We will stay in a traditional Japanese hotel in Hakuba and ski the various resorts in the area. Stay tuned for our ski report! Visiting Jimbocho Ski Street: Most shops are clustered on or around Yasukuni Dori. For Google Maps, search on London Sports Kanda or Ski Shop Vail which are both located in the center of the ski shops. Hours and acceptance of credit cards vary by store. As in all of Japan, bring lots of cash, just in case! Since that first visit to Jimbocho over two years I’ve been back several times. I bought myself ski boots in 2017 at Vail Ski Shop, the same place Mark bought his skis as described above. The boot prices at Vail weren’t the absolute lowest, but pretty close. Also I felt confident about the advice from the sales clerk who really knew his merchandise and what would work best for me. He took his time with me, and I chose to support that shop by making my purchase there instead of using his advice to buy for less elsewhere. 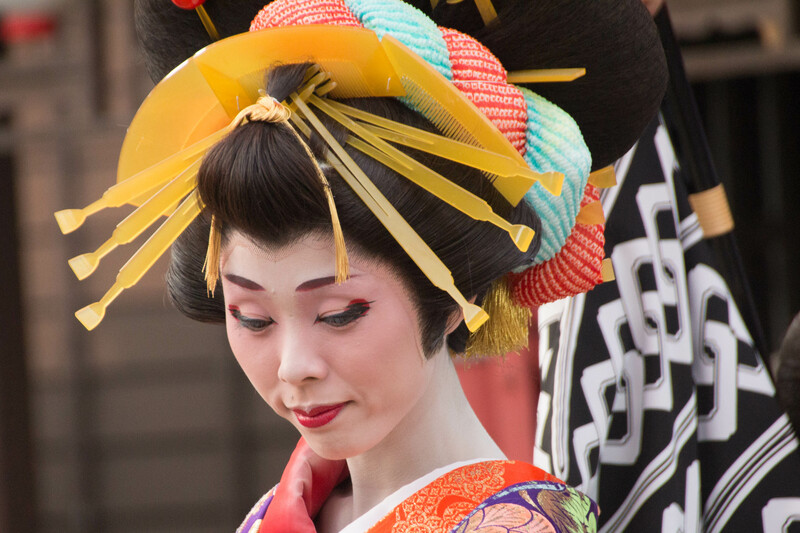 In addition to the shops mentioned above, you’ll find shops of all sizes along and just off Yasukuni Dori. Try to give yourself plenty of time to browse–it’s part of the fun! I went this month for a new ski jacket, and after an hour of browsing different shops I had a pretty good idea of my choices and price points. My latest jacket purchase came from Fuso Snowboard. It’s a medium sized shop–not a teeny hole in the wall, and not a mega-store either. I liked the range of their selection, and their prices were the lowest. Since I’m a skier and not a snowboarder I can’t really comment on their board/boot inventory; I went there just for a jacket. If you only have time to go to one place, make it Victoria Sports. With eight floors dedicated to snow sports–including an entire floor of ski wear, and another floor just for snowboard wear–you can find everything you need in one spot. The prices are good, too. The best deals are jacket and pants combos for around 12,000 yen total (just over $100 USD). The store is well organized, and it’s easy to find your way around. There are multiple Victoria Sports shops scattered around the neighborhood, with different buildings catering to different sports, like golf or biking. This is fairly common in Tokyo for all kinds of mega-shops. Clothing sizes in Japan generally run a little smaller than the West. I’m American, 5 foot 6 inches tall (167 cm), -cough, cough- lbs/kg in weight,size US Medium in clothes, size 9 US womens/40 European shoe. So in the U.S., I’m pretty average. When I try on regular Japanese clothing I’m a size Large or Extra Large, and Japanese women’s shoes don’t fit me at all. Ski jackets and pants sold in Japan generally follow Western sizing, so I wear a Women’s Medium or Men’s Small in snow pants and jackets. But since I get cold and like to wear a fleece under my jacket, I prefer a Women’s Large. And I found that a few shops didn’t even stock Women’s Large, which is crazy–they only carried Women’s Medium and smaller. If you find yourself in such a shop, move along. There are plenty more. Women’s ski boots top out at size 24.5, or about 8.5 US, 39 European. You can view conversion between Japanese, US, and European sizes here. If you wear a bigger size then look at men’s boots. Honestly I don’t know the largest size available for men’s ski or snowboard boots. Also this is really rare, but it still happens from time to time: sometimes salespeople won’t let a woman try on a men’s jacket, or boots–because they men’s. They’d rather lose the sale. Also crazy, also Move Along time. If you’re buying a jacket, make sure that there is a small zippered pocket on the lower part of the left sleeve. Japanese ski lifts use IC card scanners set up for a pass on your left arm–you just tap and go through the turnstile, just like the train. This system is not common in the U.S., so U.S. brands don’t always have this pocket (I’m looking at you, Burton). You can buy an elastic pass case that fits over your sleeve, and it’s OK–but after the first few times of launching your pass case at lunchtime as you take off your jacket…..
Don’t be That Gaijin dragging your skis or snowboard through the airport or on the train! As long as you have a two-day window before your first day on the slopes you can ship your gear like the cool kids do, using Yamato Transport Ski TA-Q-BIN. I blogged about it here. You can also ship your bags from apartments or hotels to the airport. And it’s cheap! A giant ski bag weighing about 25 kg shipped across Japan recently cost me only 3600 yen (about $33 USD) round trip (both ways). 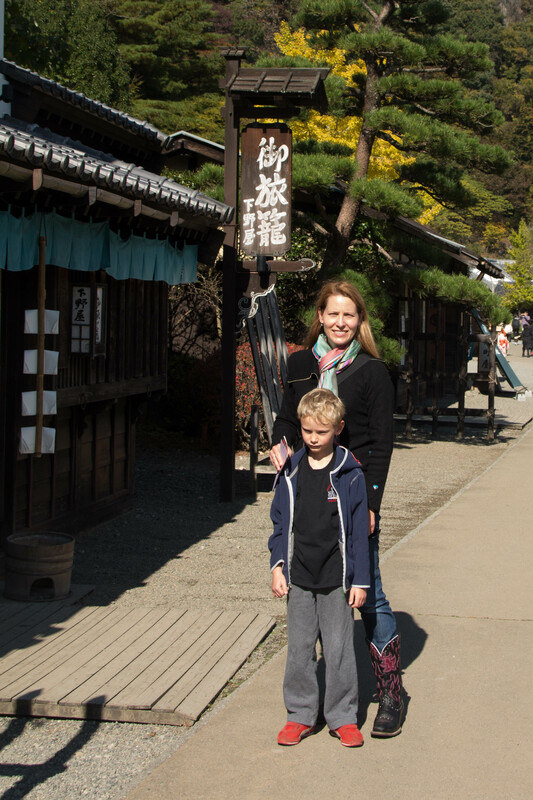 Before arriving in Japan we knew that–obviously–American holidays would not be recognized by the kids’ international school calendar. Somehow none of us really made the next leap to realize that this means that the kids actually go to school on Thanksgiving. Because here it’s just, you know, Thursday. Most Americans in Japan work for Japanese companies, which means that American Thanksgiving is a regular work day for them. As a result most Americans enjoy their Thanksgiving dinners on either Friday or Saturday. We may do the same ourselves in future years, but since it’s our first Thanksgiving here we decided to celebrate on Thursday itself. Mark had the day off since his job follows U.S. holidays, and two adults at home and no kids underfoot meant plenty of time to get our feast ready. Thanks to the commissary, grocery shopping for our dinner involved simply driving to base and picking up what we needed there. For Americans without such perks, the gathering of Thanksgiving groceries requires a little more research, networking, and overpaying at expat-gouging specialty stores. Also the hoarding of cans of pumpkin pie filling. We celebrated our meal with our friends and neighbors, The Hobbs family. Ashley, Derek, and their three children live one house over from us, and their kids and ours became fast friends as soon as we moved in. So celebrating Thanksgiving together was an obvious choice. Also Ashley and Derek have a standard U.S.-sized oven in their home–one that actually fits my roasting pan! So I conquered the turkey, stuffing, gravy, cranberry sauce, succotash, apple pie and pumpkin pie; Ashley prepared green beans, corn, rolls, mashed potatoes, brownies, Rice Krispie treats, and banana bread. I roasted the turkey in their oven, then brought it back to our house to finish up the gravy and the last few items. Then we ate. And ate. And even posed for a picture! 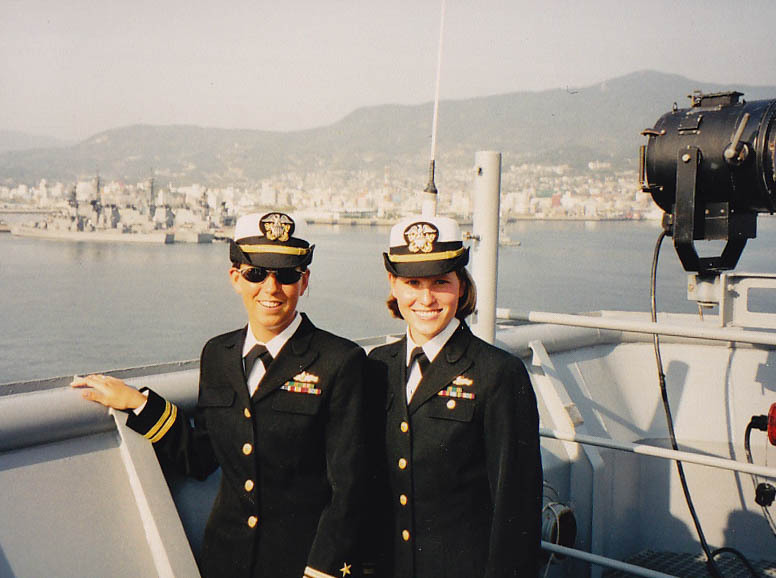 Roughly a million years ago, I was in the Navy. On my first tour I was a Surface Warfare Officer, ship’s company, Left Standard Rudder Steady Course 1-8-0 type of sailor. The kind that never sleeps, basically. My second tour was a lot more fun. I was assigned to Assault Craft Unit 5, the Navy’s West Coast hovercraft detachment. 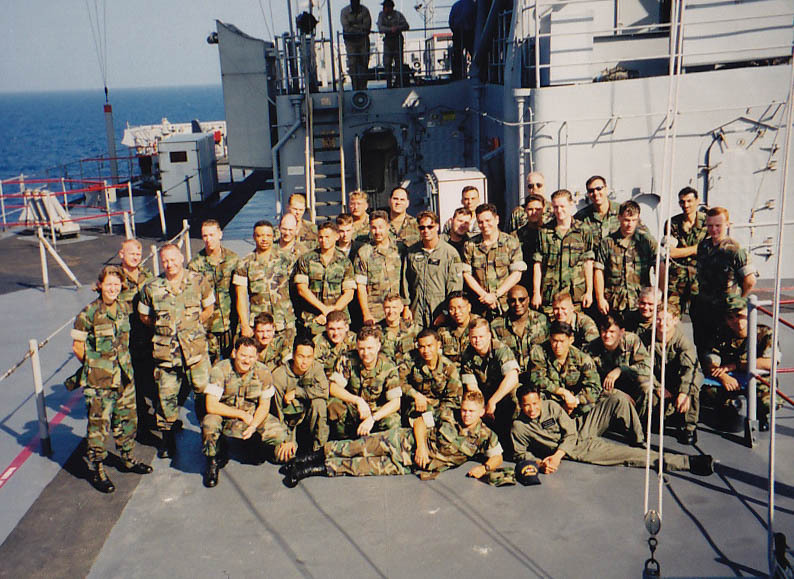 We deployed from San Diego to Sasebo Japan from 1997 to 1998. The tour was even more fun than it sounds. Hovercraft are fun, loud, and wicked fast. Our detachment consisted of six hovercraft, and I served as one of two Detachment Officers in Charge, or DET OICs. The other DET OIC was also an officer, but the rest of the DET members were all enlisted. In theory, the DET OICs outrank everyone and hold ultimate responsibility–and we did. That said the actual knowledge and experience rested with the enlisted members of the DET–the craftmasters (like pilots for the hovercraft), engineers, loadmasters, and other crew members. 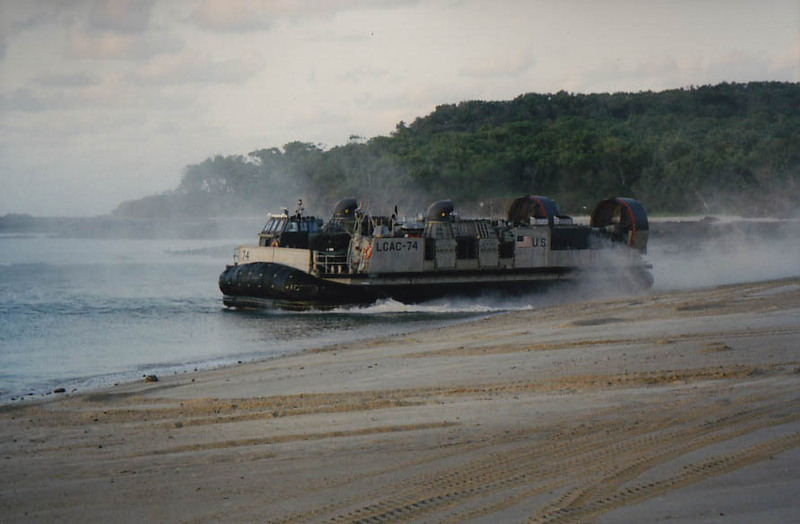 The senior enlisted personnel spent many, many years in the hovercraft community and knew….well, everything. This photo above has stuck with me throughout the years, for many reasons. The biggest one: how incredibly young I was. I was 26 years old and responsible for the well-being of over two dozen sailors, and millions of dollars in Navy equipment. But the craziest part? This was completely unremarkable. I was no rock star, super-Navy hero. I simply did the same thing that thousands of people before and since have done; I shouldered unbelievable responsibility that has few parallels in the civilian world, and at a surprisingly young age. Sailors and officers still do this, every day. Edo Wonderland. Or, When Colonial Williamsburg meets Renn Fest. In Japan. 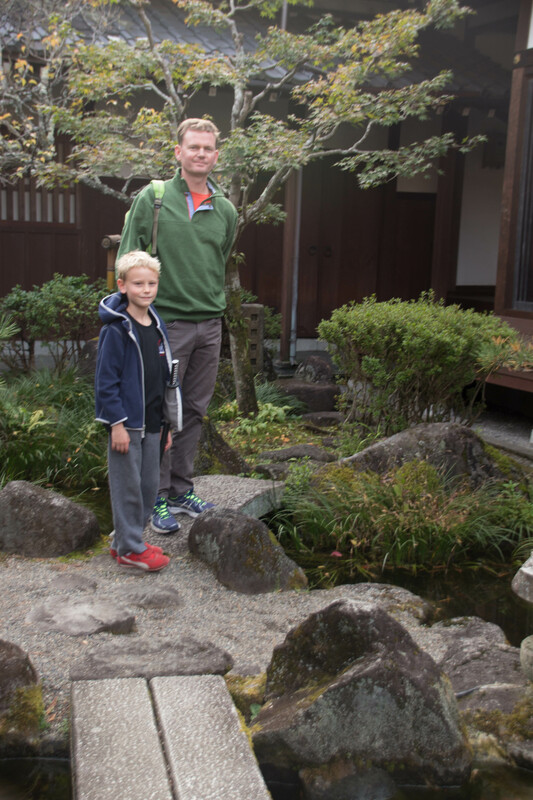 Last weekend Mark, Cy, and I headed out to Edo Wonderland, a historical theme park about two hours from Tokyo. 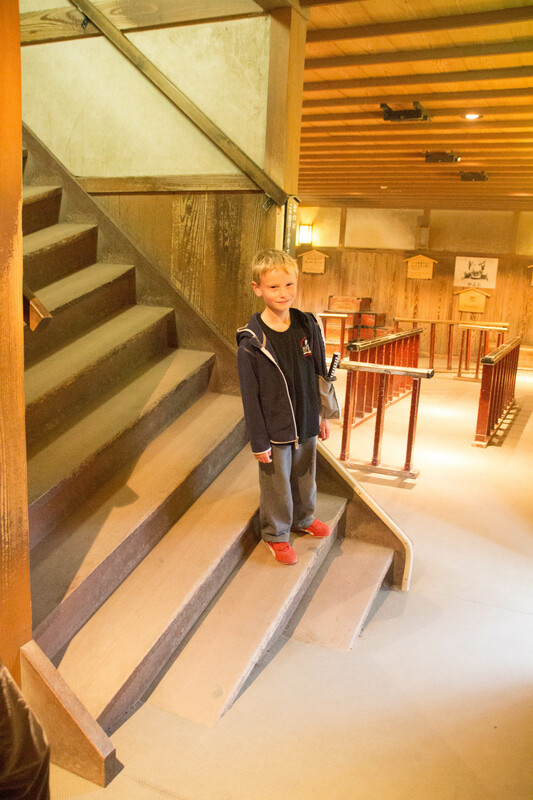 The park strives to educate its visitors about the Edo period through activities and displays that both educate and entertain–and sometimes at the same time! Edo Wonderland reminded me of a cross between the earnest historical accuracy of Colonial Williamsburg and the “History, shmistory, let’s have fun!” approach of Renaissance fairs across the U.S. You know the type of fair: wenches in costumes, jugglers, and the chance to trade your children to a band of gypsies for a smoked turkey leg–which my father actually did in the late 80’s at the Maryland Renn Fest. My sister and I lasted about three minutes until the gypsy realized that we couldn’t juggle or anything and gave us back. And my dad got to keep the turkey leg. Not that I hold a grudge or anything. Anyway! 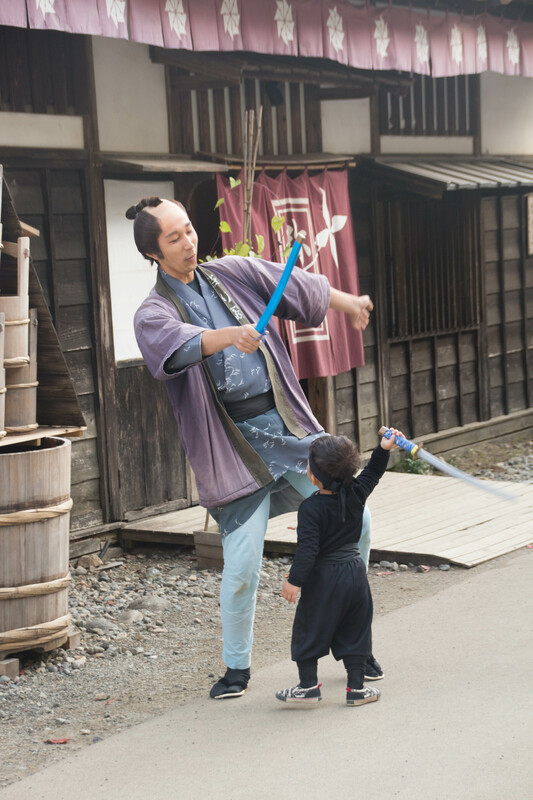 Back to the Edo Period. The Edo period (江戸時代 Edo jidai?) or Tokugawa period (徳川時代 Tokugawa jidai? 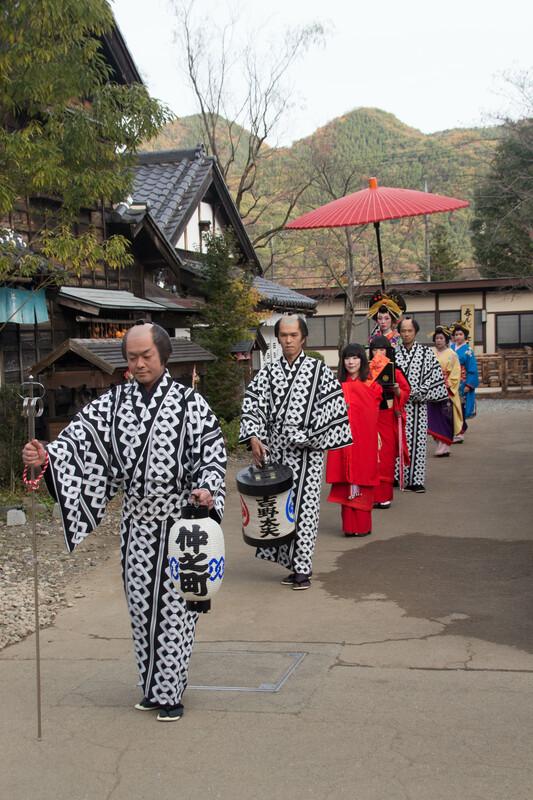 ), is the period between 1603 and 1868 in the history of Japan, when Japanese society was under the rule of theTokugawa shogunate and the country’s 300 regional Daimyo. The period was characterized by economic growth, strict social order, isolationist foreign policies, popular enjoyment of arts and culture, and sustainable forest management. Notice that there is no mention of ninjas. 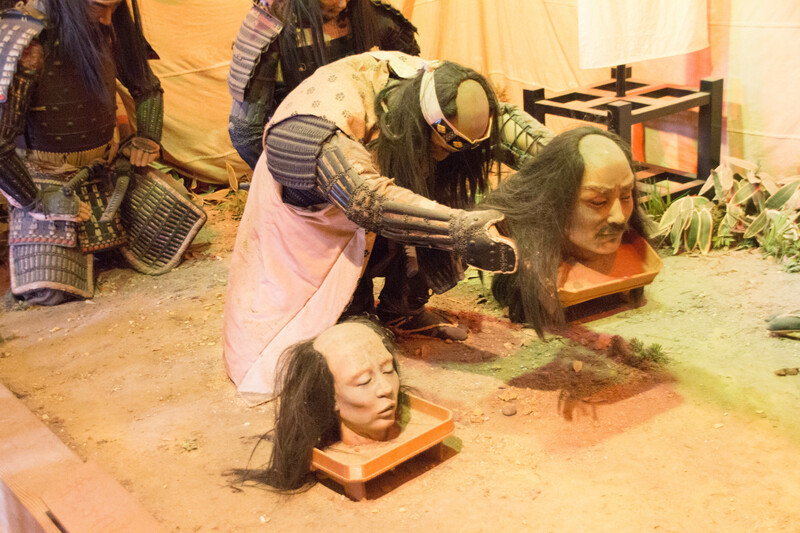 This does not stop the Edo Wonderland people from really running with the ninja theme. The performance schedule boasted several ninja shows that featured strobe lights, smoke machines, pounding house music, and not a shred of spoken dialogue in any language. 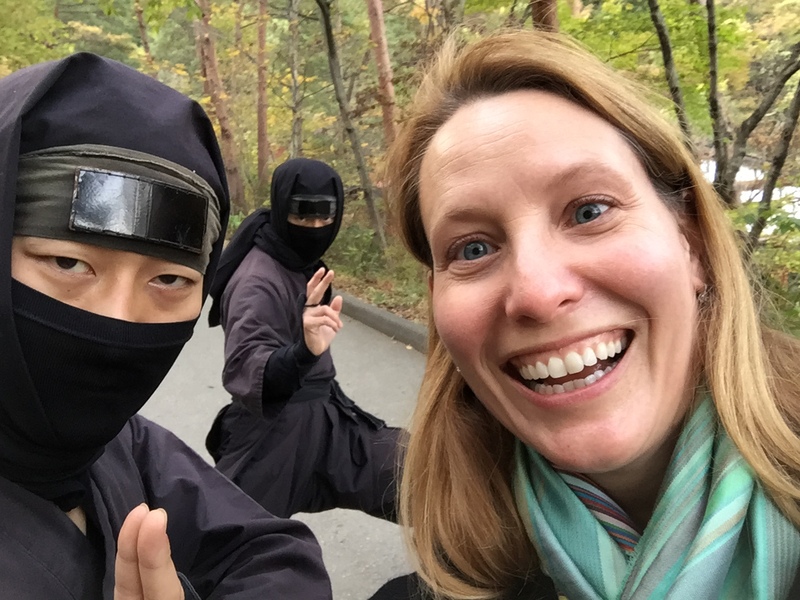 Also ninja selfies! 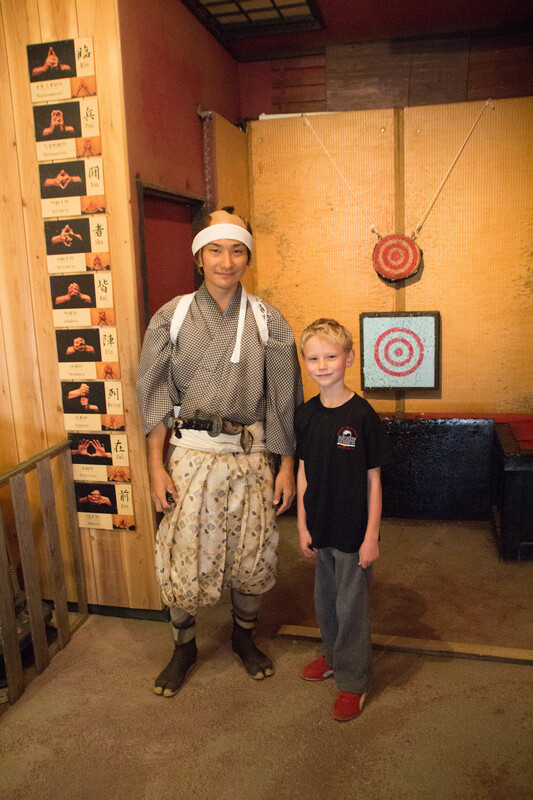 Like many theme parks, Edo Wonderland gives visitors the chance to rent period costumes. This leads to awesome interactions between toddler ninjas and park employees with wonderful senses of humor. 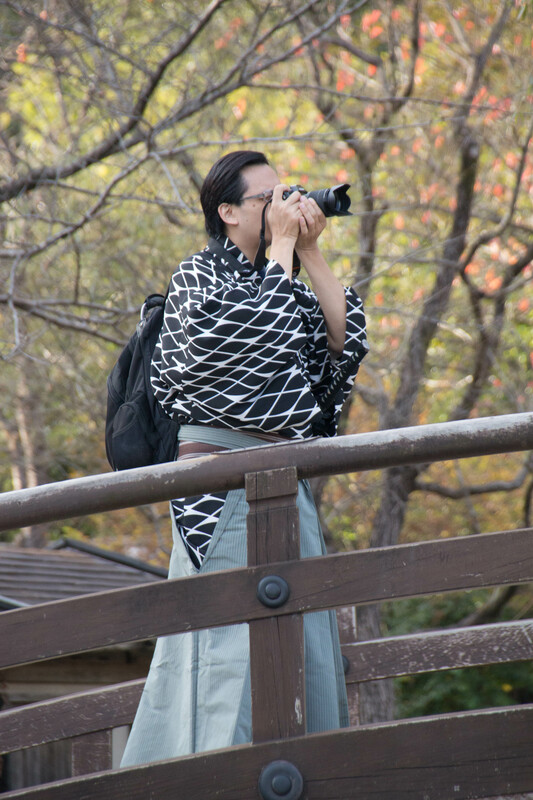 It also raises the question that we all have wondered about for years: Do Edo gentlemen prefer Canon or Nikon? Sadly, based on this photo alone, we still don’t know. 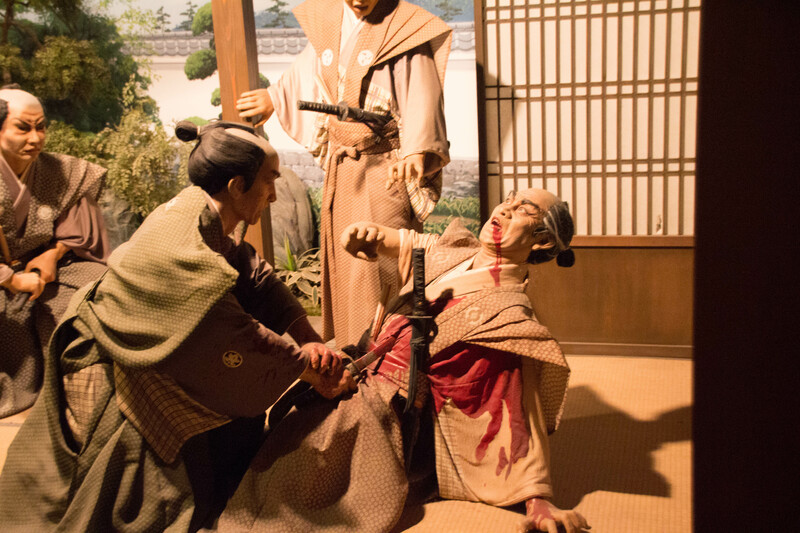 Another fabulous attraction at the park was the extensive wax museum that showed just how creative the Edo Period bossmen got at eliminating their foes. Before entering we asked Cy if he was game, and he agreed. Because it’s never to soon to rack up reasons for therapy later in life! 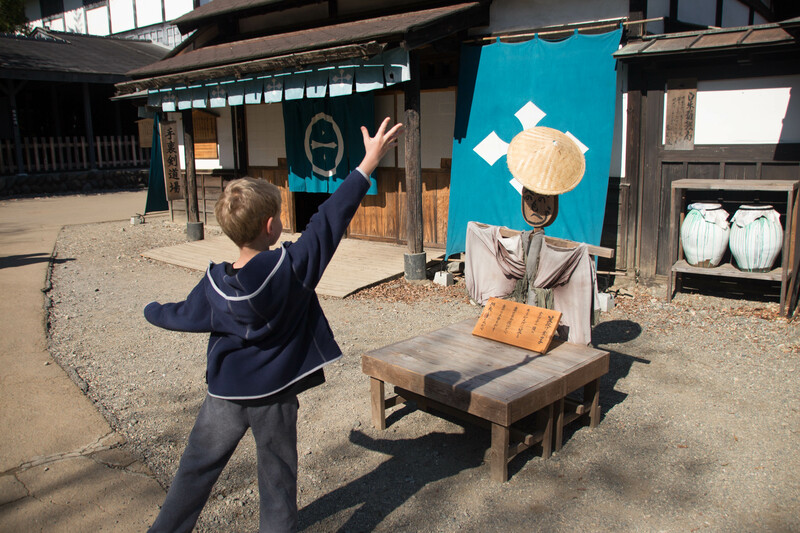 The games included freebies like “Try to Throw a Conical Hat on This Wooden Person” (no line to play, obviously), wooden tops, and Throw an Arrow Into a Cylinder. 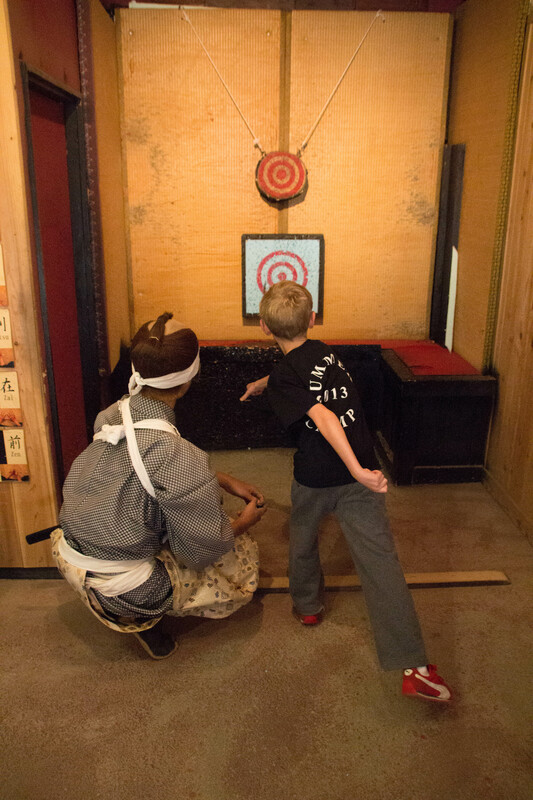 Most of the paid games weren’t much more exciting (darts, archery), except for one: throwing stars. Because you actually threw real stars. This was obviously Cy’s favorite, and I took a turn myself. 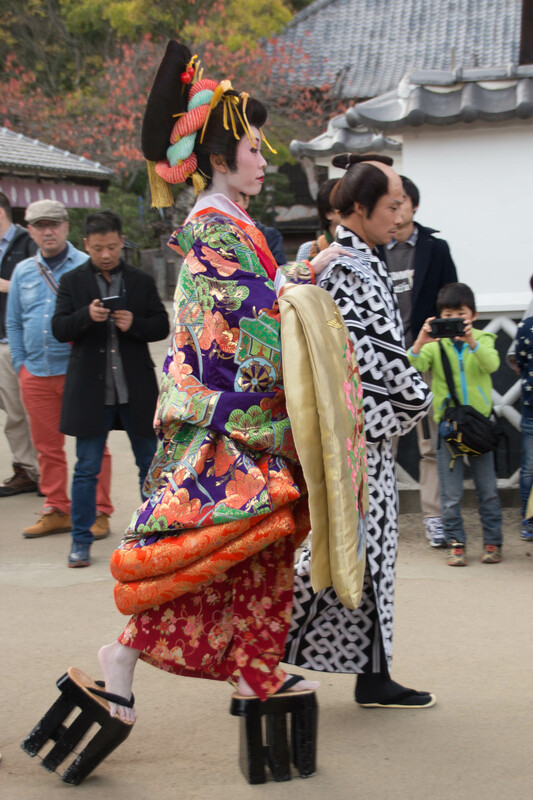 The oiran (courtesan) procession toward the end of the day proved that “I have a driver and can therefore wear crazy shoes” is a sentiment that did not originate in modern-day Manhattan after all. Possibly our favorite part of the day came at the very end, when we staggered through the crooked house built into a hillside. Historical relevance? Probably zero, and we didn’t care. 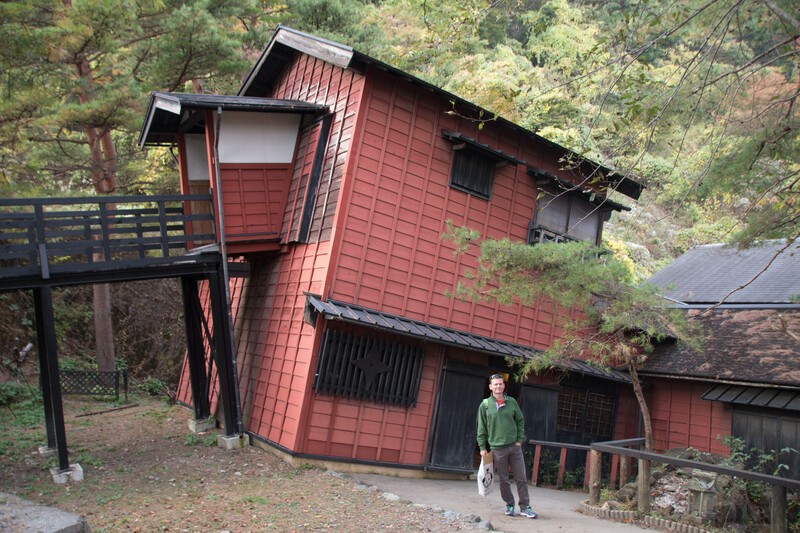 It proved surprisingly difficult to photography the extreme angle of the house relative to, you know, gravity. In the first two photos below, both Mark and Cy are standing completely upright. 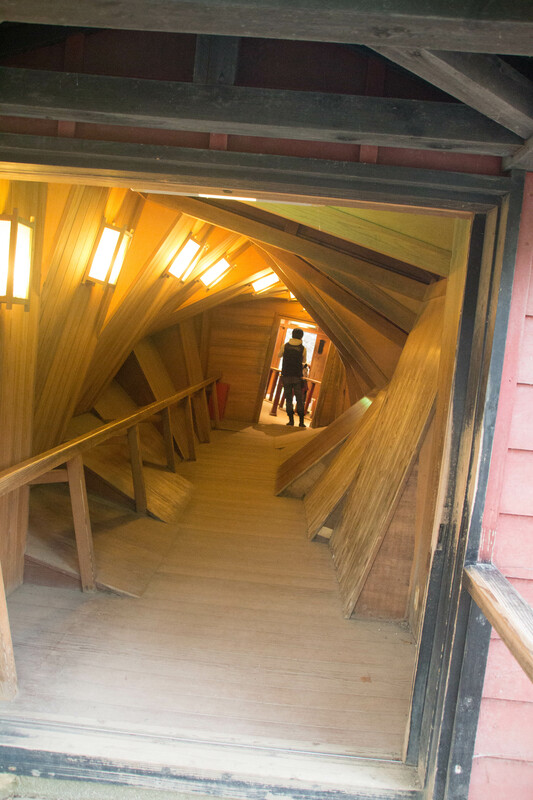 We set foot inside the crooked house and immediately staggered against the wall that looked upright, but wasn’t. I felt like an extra in the original Star Trek staggering around the USS Enterprise.